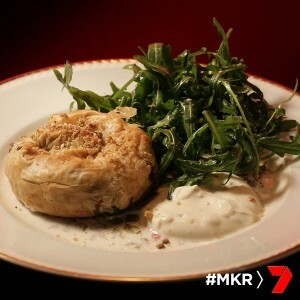 Rosie and Paige cook on MKR tonight in their Instant Restaurant Redemption Round. They need to score higher than 63 to stay in the competition as it will be a double elimination. Their last round they scored 59. The promo has shown a fight tonight between Carmine and Lauren and Monique and Sarah. What will the fight be about? For entree, Rosie and Paige are making a spice lamb filo rolls with yoghurt sauce recipe. Main course is chicken shawarma with flatbread and hommus, and dessert is orange and almond syrup cake. There is three hours left on the clock when they come back from the shop. They quickly set up their restaurant and have 2 hours and 40 minutes to cook. The team start on the flat bread and the dukkah. With an hour down, the team start on the ice cream for the cake. They realise they haven’t got a lot done in prep time, the guests arrive. All the guests can feel something is going to explode tonight. Lauren comments that the mood is awkward tonight. 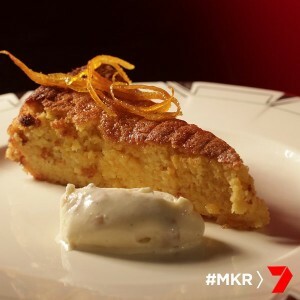 Where will Rosie and Paige score on the MKR scoreboard? Rosie gets the ice-cream mix into the churner straight away and Paige is cooking the lamb for the filo rolls. Back in the dining room there is definitely tension in the air. Monique brings up Lauren’s comments on strategic scoring. Lauren and Monique exchange words and Lauren points her finger at Monique. It is very awkward. Lauren said her comments were a general comment and were not an attack. She says for Monique to not tell her what to do. Then the judges arrive. They could sense the tension straight away. Rosie and Paige welcome the judges and the menu is revealed. The menu has a Middle Eastern theme. Rosie makes her shawarma marinade mix and she has accidentally put cayenne pepper in instead of paprika. She adds some yoghurt and other spices to try and tone down the spice. They get their mince mix ready and roll it in the filo pastry. They pop them all into the oven and wait for them to become golden brown. They come out the oven and they are golden and crunchy. The girls take their first dish out to the judges. Pete and Manu taste the dish. Pete says the lamb filo roll was to die for and he loved the pine nuts and the textural components. The yoghurt sauce was yum, he loved the garlic in it. Many says it was good, it was great. He loved the spice and the texture. He said they should be proud of themselves. He said there could have been a few more layers of filo pastry if he could pick a negative. The other guests taste their food. They all love it. Rosie and Paige get back into the kitchen to check on their ice-cream. It’s looking good so they pop it into the freezer. They get started on the chicken dish. Paige makes the hommus while Rosie is making the flatbread and the chicken at the same time and it is too much for her. She is burning some of the chicken and the flatbread and is generally overwhelmed by how much they have to do. 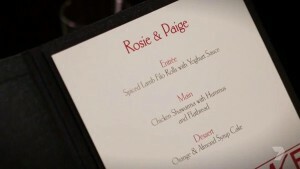 Paige swaps jobs with Rosie and takes over and cooks the chicken. Rosie makes the yoghurt sauce instead. The girls are not really happy with how the flat bread has turned out. Once the chicken is cooked Paige gets started on the orange syrup cake. They start plating up the main and are very happy with how it looks. How will the judges score this dish? They take it out to the judges. Pete and Manu taste the dish. Manu says the dish is amazing. 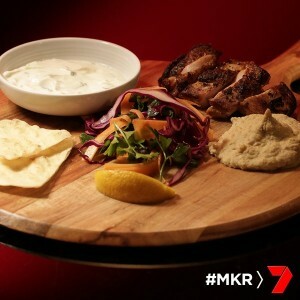 He says the flavours are dancing and jumping, the hommus and yoghurt is nice. The bread has been rolled out too thin but it’s a really yummy dish overall. Pete says it’s one of the nicest chicken meals he has eaten in the competition and that they have redeemed themselves. The other contestants taste the dish. Most of the other contestants love the meal and Monique and Sarah have a few critiques. Hazel loved the dish but was shocked to find raw chicken on her plate. Rosie and Paige get back into the kitchen to check on the ice-cream and cake. The ice-cream is not quite set yet and they forgot to add the almonds through it so they do it quickly now. Then they decide they are not happy with it and wonder if they should leave it off the plate as it is not on the menu. Rosie suggests just whipping up some cream as the cake needs something to go with it. Paige then suggests that she scoops out little bits of the good ice-cream and just put it directly onto the plate. The ice-cream begins to melt so they rush the plates out to everyone. Pete and Manu taste the dessert. Pete doesn’t have too much to say excepts that the cake works. He only would have liked a little more syrup. Manu says the recipe was simple but it hits the spot. With the ice-cream though, the texture was not quite right. The other contestants taste the dish. Most of the contestants enjoy the dish, Monique and Sarah however do not like it. This puts Rosie and Paige are at the top of the redemption leaderboard. This means that Monique and Sarah are still at the bottom, but there is a twist and they might be eliminated from My Kitchen Rules. The Orange Syrup cake looked amazing it would be great if you supplied the recipe. Love the show never miss it.